Morchella esculenta - Yellow Morel. Choice eating. Found in early spring to early June in burned areas, apple orchards and around Elm, Oak, Ash and Maple/Beech woods. Location: Central PA. Photo by Michelle Molina. 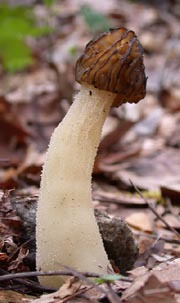 Morchella angusticeps - Peck's Morel, one of a complex of Black Morels. Considered an excellent edible but might cause stomach upset, especially if consumed with alcohol. Found in poplar forests and is the first to poke its head out in spring. Location: Central PA. Photo by Michelle Molina. Morchella semilibera - Half-free Morel: This one can be easily confused with Verpa bohemica. Differences: The former (one shown) is hollow and the cap is attached to the trunk about halfway down. Edible. The latter's trunk is full of a cottony material and the cap is only attached to the trunk at the top. Causes allergic reactions.